The future lies in space, agreed the participants of the IV München Global Forum, who were introduced to the topic “SPACE – THE NEW PLACE? Opportunities and Risks of Space Traffic”. The catchword “New Space” played an important role, as the term summarizes the multitude of new business models for the commercial use of space. On February 4, Global Bridges members, young leaders and friends gathered in the beautiful snow-covered city of Munich to discuss this exciting and highly topical issue. Guest speakers included Dr. Johannes von Thadden, Senior Vice President and Head of International & Space Institutions at Airbus, Dr. Dirk-Roger Schmitt, Business Manager at the German Aerospace Center (DLR) and Klaus-Peter Willsch, Member of the German Bundestag (CDU/CSU) and Chairman of the Aerospace Parliamentary Group. 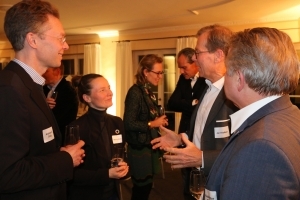 Representatives of the two Munich space start-up companies CloudEO and Mynaric were also in attendance and enriched the discussion with direct insights into space travel from a business perspective. Space has long since ceased to be just a distant thought but now affects almost all areas of daily life, a fact that Dr. Johannes von Thadden made clear right at the beginning of the discussion. Without satellites, not only would financial markets, air traffic and ATMs fail, but also mobile networks and internet connections would collapse. Until 1990, the USA and the Soviet Union were responsible for 93 percent of all satellites. Today, more than 60 countries operate their own satellites. “The race of nations in space is getting tougher,” says Dr. Johannes von Thadden. DLR representative Dr. Dirk-Roger Schmitt also made it clear how important it is that Germany does not lose out in the space-race. In the USA, for example, efforts are already being made to deploy a “space force”. This is a sixth branch of the armed forces of the United States, which is to take over military operations in space. A total of 1886 active satellites are currently in space. The USA operates 859 satellites, China 250, Russia 146 and Germany 29. The majority of these satellites are used for purely commercial purposes, the function of which is predominantly communication. A further 20,000 satellites are planned over the next ten years – stemming from only 19 companies. Due to the resulting high volume of traffic in space, traffic regulations are vital. However, the implementation of an international system is still in its infancy. So far, only about 20 countries have a national space law, and Germany is not one of them. Willsch pointed out, however, that the German Federal Government is already working on bringing such a law to fruition. In addition, the space scrap is, due largely to the boom of the private space travel, becoming an ever-growing problem – among other reasons, because a collision of space objects cannot be excluded from possibility. However, there are currently no binding regulations for dealing with space debris, although there are currently around 23,000 scrap objects in space. What does the future hold for space travel? Space-mining was mentioned. But what happens to the raw materials that are mined? 3D printing from satellites could be an option. Is all this really possible or just an idea for the next science fiction film? 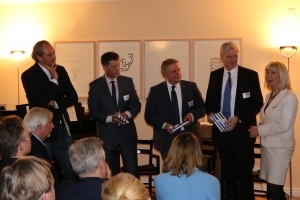 “Yes,” said Dr. Johannes von Thadden, “it is possible and it will happen.” But if Europe doesn’t make an effort, it will lose the space-connection, agreed our expert panelists. The audience was visibly carried away by the enthusiasm and euphoria with which the three speakers reported on the topic. Even after the official end of the panel, the discussion continued into the late evening with wine and a wonderful buffet.